This is my self advanced INSANE way of Crit Reave Ranger. The Build builds around the Defence nodes in the passive Skill Tree. 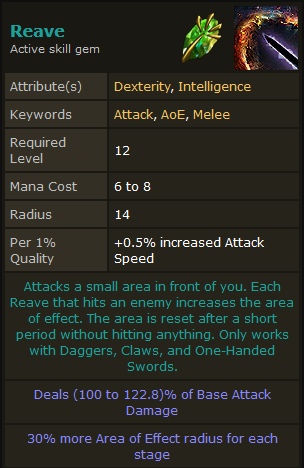 Basically we want to get a high Defences Shield with high Crit Weapon with alot of AoE from Reave. We will have a good Life Pool (around 3-4K) and a good Energy Shield Pool (Around 2-3K). The Damage in my opinion is insane and it's a really fast style of gameplay, whirling Blades makes this build really enjoyable. With Vaal Reave and normal Reave there is a 8 Stack Reave possible which gives 240% increased Area Of Effect, so you will be hitting enemys even out of the border of your Screen. The Life Pool saves us from Chaos Damage and just gives us Higher Hit Points (How much dmg u need to receive to die). The Energy Shield Pool gives us more Hit Points and reduced chance to get stunned. With the Claw in this Build we will leech Life aswell as Mana. Vaal Pact makes the Life Leech apply instantly instead of a capped Heal per Second. Ghost Reaver makes Life Leech apply to Energy Shield. #Build is similar to the one from Etup. Alternative would be to use Cyclone/Wild Strike as Main Skill. If you have Problems managing Int or Strenght, pick up the +30 nodes or gear. Also you got around 40-50% Block Chance for Melee. None are necessary, some are pretty good though. adds another 1000/800 to your defences. Im also free for Ideas like the Hidden Potential Gem with only magic Items. 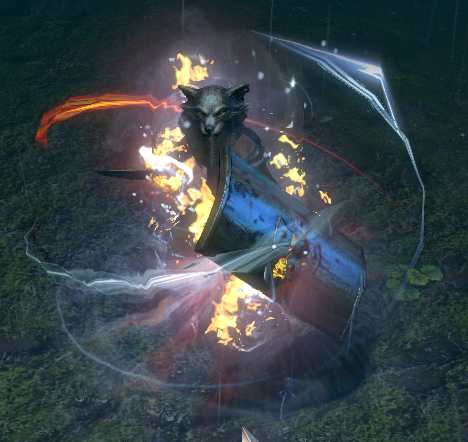 My idea is Doing alot of Fast Hits with Wildstrike, getting them crit's and a good amount of damage already with Wild Strike, and then hit really hard with the CoC EK and Arctic Breath combination. And even stun-freezing some. I took the for me awesome part out of both und combined it with something i tested personally. Alternative would be to use Cyclone as Main Skill, which needs alot less Mana. Just from the Shield. (you loose some damage compared to other Build'S , since no Spell Power) but that should be fine. Also you got around 48% Block Chance for Melee. I will test it in tempest. level 31 atm. Need to figure some level process out. since u have not a lot of damage before you go to atleast 4 L.